The Johns Hopkins University, M.H.S. 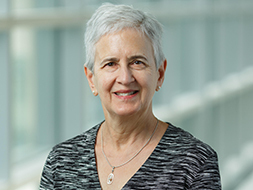 Deborah Garnick has thirty years of research experience, largely focused on healthcare quality and the development of performance measures. Currently, she directs the Brandeis sub-contract for a project focused on developing and testing performance measures for Medicaid. Working with colleagues at the Heller School’s Institute for Behavioral Health, several recent projects are focused on investigating the association of process measures focused on the timing and quantity of treatment services for substance use disorders and outcomes. With funding from the National Institute on Alcohol Abuse and Alcoholism (NIAAA), the National Institute on Drug Abuse (NIDA) and the Robert Wood Johnson Foundation, she has directed teams that are contributing to the literature on the association of engagement in treatment with multiple outcomes including arrests, employment, drug and substance use. Currently, with funding from the National Institute on Drug Abuse (NIDA), and as a component project of the The Brandeis/Harvard Center to Improve System Performance of Substance Use Disorder Treatment, she directs a team collaborating with Washington State to randomize public treatment agencies to study the impact of financial supports for improving substance abuse treatment performance rates compared with sending providers alerts for achieving higher performance, both interventions, and a control arm. She also leads the Brandeis team (as sub to MPR) in a CMS project to specify and test performance measures. She is a co-Investigator in the NIDA and NIAAA-supported ongoing national survey of the provision of behavioral health services in private health plans. Acevedo A, Lee MT, Garnick DW, et al.. "Agency-level financial incentives and electronic reminders to improve continuity of care after discharge from residential treatment and detoxification.." Drug Alcohol Dependence 183 (2018): 192-200. Acevedo A, Miles J, Garnick DW, et al.. "Employment after beginning treatment for substance use disorders: The impact of race/ethnicity and client community of residence." J Subst Abuse Treatment 87 (2018): 31-41. Hodgkin D, Horgan CM, Stewart MT, Quinn, A E, Creedon, TB, Reif, S, & Garnick, DW. "Federal Parity and Access to Behavioral Health Care in Private Health Plans.." Psychiatric Services 69. 4 (2018): 396-402. Stewart MT, Horgan CM, Hodgkin D, Creedon T, Quinn AE, Garito L, Reif S, Garnick DW.. "Behavioral health coverage under the Affordable Care Act: What can we learn from marketplace products?." Psychiatric Services 69. 3 (2018): 315-321. Thomas CP, Ritter GA, Harris AHS, Garnick DW, Freedman KI, Herbert B.. "Applying American Society of Addiction Medicine Performance Measures in Commercial Health Insurance and Services Data." J Addict Med. 12. 4 (2018): 287-294. Garnick DW, Horgan CM, Acevedo A, et al. "Influencing quality of outpatient SUD care: Implementation of alerts and incentives in Washington State." J Subst Abuse Treatment 82 (2017): 93-101..
Garnick, DW, Horgan, CM, Merrick, EL, Hodgkin, D, Reif, ., Quinn, A . Stewart, M, Creedon, TB. "Private Health Plans' Contracts with Managed Behavioral Healthcare Organizations." J Behav Health Serv Research 44. 1 (2017): 149-157. Horgan, C. M., Hodgkin, D., Stewart, M. T., Quinn, A., Merrick, E. L., Reif, S., . . . Creedon, T. B.. "Health Plans' Early Response to Federal Parity Legislation for Mental Health and Addiction Services.." Psychiatric Services 67. 2 (2017): 162-168. Quinn AE, Reif S, Merrick EL, Horgan CM, Garnick DW, Stewart MT.. "How do private health plans manage specialty behavioral health treatment entry and continuing care?." Psychiatric Services 68. 9 (2017): 9331-937. Reif S, Creedon TB, Horgan CH, Stewart MT, Garnick DW.. "Commercial health plan coverage of treatment for selected opioid use disorders from 2003 to 2014.." Journal of Psychoactive Drugs 49. 2 (2017): 102-110. Reif, S, Acevedo, A, Garnick, DW, & Fullerton, CA. "Reducing Behavioral Health Inpatient Readmissions for People With Substance Use Disorders: Do Follow-Up Services Matter?." Psychiatric Services 68. 8 (2017): 810-818. Stewart MT, Horgan CM, Quinn A, Garnick DW, Reif S, Creedon TB, Merrick EL. "The role of health plans in supporting behavioral health integration." Administration and Policy in Mental Health and Mental Health Services Research 44. 6 (2017): 967-977. Acevedo, A., Garnick, D., Ritter, G., Lundgren, L., & Horgan, C.. "Admissions to detoxification after treatment: Does engagement make a difference?." Substance Abuse 37. 2 (2016): 364-371. Horgan CM, Hodgkin D, Stewart MT, Quinn A, Merrick EL, Reif S, Garnick DW, Creedon TB.. "Health Plans' Early Response to Federal Parity Legislation for Mental Health and Addiction Services.." Psychiatric Services 67. 2 (2016): 162-168. Horgan CM, Stewart MT, Reif S, Garnick DW, Hodgkin D, Merrick EL, Quinn AE. "Behavioral Health Services in the Changing Landscape of Private Health Plans. Psychiatric services.." Psychiatric Services 67. 6 (2016): 622-629. Quinn, A. E., Reif, S., Evans, B., Creedon, T. B., Stewart, M. T., Garnick, D. W., & Horgan, C. M.. "How health plans promote health IT to improve behavioral health care." American Journal of Managed Care 22. 12 (2016): 810-815. Tschampl CA, Garnick DW, Zuroweste E, Razavi M, Shepard DS.. "Tschampl CA, Garnick DW, Zuroweste E, Razavi M, Shepard DS. Use of Transnational Services to Prevent Treatment Interruption in Tuberculosis-Infected Persons Who Leave the United States.." Emerging infectious diseases. 22. 3 (2016): 417-425. Acevedo A, Garnick D, Ritter G, Lundgren L, Horgan C.. "Admissions to Detoxification after Treatment: Does Engagement Make a Difference?." Substance Abuse. 37 (2) (2015): 364-371. Acevedo A, Garnick DW, Dunigan R, Horgan CM, Ritter GA, Lee MT, Panas L, Campbell K, Haberlin K, Lambert-Wacey D, Leeper T, Reynolds M, Wright D. "Performance measures and racial/ethnic disparities in the treatment of substance use disorders." Journal of Studies on Alcohol and Drugs 76. 1 (2015): 57-67. Acevedo, A., Garnick, D., Ritter, G., Horgan, C., & Lundgren, L.. "Race/ethnicity and quality indicators for outpatient treatment for substance use disorders.." American Journal on Addictions 24. 6 (2015): 523-531. Garnick DW, Horgan CM, Merrick EL, Hodgkin D, Reif S, Quinn AE, Stewart M, Creedon TB.. "Private Health Plans' Contracts with Managed Behavioral Healthcare Organizations.." J Behavioral Health Services and Research 44. 1 (2015): 149-157. Zhu, J, Wiengart SN, Ritter GA, Tompkins CP, Garnick DW. "Racial/Ethnic disparities in patient experience with communication in hospitals: real differences or measurement errors?." Medical Care 53. 5 (2015): 446-454. Dunigan R, Acevedo A, Campbell K, Garnick DW, Horgan CM, Huber A, Lee MT, Pnana L, Ritter GA. "Engagement in outpatient substance abuse treatment and employment outcomes." Journal of Behavioral Health Services and Research 41. 1 (2014): 20-36. Garnick DW, Horgan CM, Acevedo A, Lee MT, Panas L, Ritter GA, Dunigan R, Bidorini A, Campbell K, Haberlin K, Huber A, Lambert-Wacey D, Leeper T, Reynolds M, Wright D.. "Criminal justice outcomes after engagement in outpatient substance abuse treatment." Journal of Substance Abuse Treatment 46. 3 (2014): 295-305. Lee MT, Horgan CM, Garnick DW, Acevedo A, Panas L, Ritter GA, Dunigan R, Babakhanlou-Chase H, Bidorini A, Campbell K, Haberlin K, Huber A, Lambert-Wacey D, Leeper T, Reynolds M. "A performance measure for continuity of care after detoxification: relationship with outcomes." Journal of Substance Abuse Treatment 47. 2 (2014): 130-139. Ryan M, Merrick EL, Hodgkin D, Horgan CM, Garnick DW, Panas L, Ritter G, Blow FC, Saitz R.. "Drinking Patterns of Older Adults with Chronic Medical Conditions.." Journal of General Internal Medicine 28. 10 (2013): 1326-1332. Stewart MT, Horgan CM, garnick DW, Ritter G, McLellan AT. "Performance Contracting and Quality Improvement in Outpatient Treatment: Effects on Waiting Time and Length of Stay." Journal of Substance Abuse Treatment 44. 1 (2013): 27-33. Thomas CP, Garnick, DW, Horgan CM, Miller K, Harris H & Rosen MM. "Establishing the feasibility of measuring performance in use of addiction pharmacotherapy.." Journal of Substance Abuse Treatment 45. 1 (2013): 11-18. Acevedo A, Garnick DW, Lee M, Horgan CM, Ritter L, et. al. "Racial/ethnic Differences in Substance Abuse Treatment Initiation and Engagement." Journal of Ethnicity in Substance Abuse 11. 1 (2012): 1-21. Garnick DW, Horgan C M, Acevedo A., McCorry F, & Weisner C. "Performance measures for substance use disorders -- what research is needed?." Addiction Science and Clinical Practice 7. 1 (2012). Garnick, DW, Lee MT, O'Brien ML, Panas L, Ritter GA, Acevedo A, Garner BR, Funk RR, Godley MD. "The Washington Circle engagement performance measures' association with adolescent treatment outcomes." Drug and Alcohol Dependence 124. 3 (2012): 250-258. Lee MT, Garnick DW, O'Brien PL, Panas L, Ritter GA, Acevedo A et. al. "Adolescent treatment initiation and engagement in an evidence-based practice initiative." Journal of Substance Abuse Treatment 42. 4 (2012): 346-355. Zhu J, Li L, Li X, Shi M, Garnick DW, Weingart SN. "What Constitutes Patient Safety Culture in Chinese Hospitals." International Journal for Quality in Healthcare 24. 3 (2012): 1-8. Garnick DW, Lee MT, Horgan C, et al. "Lessons from five states: Public sector use of the Washington Circle performance measures. J Subst Abuse Treat." Journal of Substance Abuse Treatment 40. (2011): 241-254. Merrick ES, Hodgkin D, Garnick DW, Horgan C, Panas L, Ryan M, Blow FC, Saitz R. "Merrick ES, Hodgkin D, Garnick DW, et al. Older adults' inpatient and emergency department utilization for ambulatory-care-sensitive conditions: relationship with alcohol consumption.." Journal of Aging and Health 23. (2011): 86-111. Reif S, Horgan CM, Garnick DW, McLellan DL.. "Systems-Level Smoking Cessation Activities by Private Health Plans." Preventing Chronic Disease 8. 1 (2011). Thomas CP, Garnick DW, Horgan CM, McCorry F, et. al. "Advancing Performance Measures for Use of Medications in Substance Abuse Treatment." Journal of Substance Abuse Treatment 40. 1 (2011): 35-43. Tschampl C, Bernardo M, Garvey T, Garnick D. "A Performance Measures Proposal on Testing for Latent Tuberculosis Infection (LTBI) in the Primary Care Sector." Joint Commission Journal on Quality and Patient Safety 37. 7 (2011): 309-316. Garner BR, Godley MD, Funk RR, Lee MT, Garnick DW. "The Washington Circle Continuity of Care Performance Measure: Predictive Validity with Adolescents Discharged from Residential Treatment." Journal of Substance Abuse Treatment 38. 1 (2010): 3-11. Garnick, D. W., Lee, M. T., Horgan, C. M., Acevedo, A.. "Adapting Washington Circle performance measures for public sector substance abuse treatment systems." J Subst Abuse Treat 36. 3 (2009): 265-77. Hodgkin, D., Horgan, C. M., Garnick, D. W., Merrick, E. L.. "Benefit limits for behavioral health care in private health plans." Adm Policy Ment Health 36. 1 (2009): 15-23. Horgan, C. M., Garnick, D. W., Merrick, E. L., Hodgkin, D.. "Changes in how health plans provide behavioral health services." J Behav Health Serv Res 36. 1 (2009): 11-24. Merrick EL, Horgan CM, Garnick DW, Reif S, Steward MT.. "Accessing Specialty Behavioral Health Treatment in Private Health Plans." Administration and Policy in Mental Health and Mental Health Services Research 36. 1 (2009): 15-23. Horgan, C. M., Reif, S., Hodgkin, D., Garnick, D. W., Merrick, E. L.. "Availability of addiction medications in private health plans." J Subst Abuse Treat 34. 2 (2008): 147-56. Merrick, E. L., Hodgkin, D., Garnick, D. W., Horgan, C. M., Panas, L., Ryan, M., Saitz, R., Blow, F. C.. "Unhealthy drinking patterns and receipt of preventive medical services by older adults." J Gen Intern Med 23. 11 (2008): 1741-8. Merrick, E. L., Hodgkin, D., Horgan, C. M., Garnick, D. W., McLaughlin, T. J.. "Changing mental health gatekeeping: effects on performance indicators." J Behav Health Serv Res 35. 1 (2008): 3-19. Merrick, E. L., Horgan, C. M., Garnick, D. W., Hodgkin, D., Morley, M.. "Health plans' disease management programs: extending across the medical and behavioral health spectrum?." J Ambul Care Manage 31. 4 (2008): 342-53. Merrick, E. L., Horgan, C. M., Garnick, D. W., Reif, S., Stewart, M. T.. "Accessing Specialty Behavioral Health Treatment in Private Health Plans." J Behav Health Serv Res (2008). Bradshaw, L., Garnick, D., Kivlahan, D. R.. "Response: setting the stage for improvement and accountability." Sci Pract Perspect 3. 2 (2007): 45-7. Garnick, D. W., Horgan, C. M., Lee, M. T., Panas, L., Ritter, G. A., Davis, S., Leeper, T., Moore, R., Reynolds, M.. "Are Washington Circle performance measures associated with decreased criminal activity following treatment?." J Subst Abuse Treat 33. 4 (2007): 341-52. Garnick, D. W., Horgan, C. M., Merrick, E. L., Hoyt, A.. "Identification and treatment of mental and substance use conditions: health plans strategies." Med Care 45. 11 (2007): 1060-7. Hodgkin, D., Horgan, C. M., Garnick, D. W., Len Merrick, E., Volpe-Vartanian, J.. "Management of access to branded psychotropic medications in private health plans." Clin Ther 29. 2 (2007): 371-80. Hodgkin, D., Merrick, E. L., Horgan, C. M., Garnick, D. W., McLaughlin, T. J.. "Does type of gatekeeping model affect access to outpatient specialty mental health services?." Health Serv Res 42. 1 Pt 1 (2007): 104-23. Horgan, C. M., Garnick, D. W., Merrick, E. L., Hoyt, A.. "Health plan requirements for mental health and substance use screening in primary care." J Gen Intern Med 22. 7 (2007): 930-6. Garnick, D. W., Horgan, C. M., Chalk, M.. "Performance measures for alcohol and other drug services." Alcohol Res Health 29. 1 (2006): 19-26. Lee, M. T., Garnick, D. W., Horgan, C. M., Cavanaugh, D. A.. "Constructing adolescent substance abuse performance measures using administrative data." J Healthc Qual 28. 3 (2006): 42-8, 59. Merrick, E. L., Horgan, C. M., Garnick, D. W., Hodgkin, D.. "Managed care organizations' use of treatment management strategies for outpatient mental health care." Adm Policy Ment Health 33. 1 (2006): 104-14. Lee, M. T., Garnick, D. W., Miller, K., Horgan, C. M.. "Datapoints: adolescents with substance abuse: are health plans missing them?." Psychiatr Serv 55. 2 (2004): 116. Hodgkin, D., Horgan, C. M., Garnick, D. W., Merrick, E. L.. "Cost sharing for substance abuse and mental health services in managed care plans." Med Care Res Rev 60. 1 (2003): 101-16. Bishop, C. E., Gilden, D., Blom, J., Kubisiak, J., Hakim, R., Lee, A., Garnick, D. W.. "Medicare spending for injured elders: are there opportunities for savings?." Health Aff (Millwood) 21. 6 (2002): 215-23. Garnick, D. W., Hodgkin, D., Horgan, C. M.. "Selecting data sources for substance abuse services research." J Subst Abuse Treat 22. 1 (2002): 11-22. Garnick, D. W., Horgan, C. M., Merrick, E. L., Hodgkin, D., Faulkner, D., Bryson, S.. "Managed care plans' requirements for screening for alcohol, drug, and mental health problems in primary care." Am J Manag Care 8. 10 (2002): 879-88. Garnick, D. W., Lee, M. T., Chalk, M., Gastfriend, D., Horgan, C. M., McCorry, F., McLellan, A. T., Merrick, E. L.. "Establishing the feasibility of performance measures for alcohol and other drugs." J Subst Abuse Treat 23. 4 (2002): 375-85. Hodgkin, D., Horgan, C. M., Garnick, D. W., Merrick, E. L.. "Quality standards and incentives in managed care organizations' specialty contracts for behavioral health." J Ment Health Policy Econ 5. 2 (2002): 61-9. Levy Merrick, E., Garnick, D. W., Horgan, C. M., Hodgkin, D.. "Quality measurement and accountability for substance abuse and mental health services in managed care organizations." Med Care 40. 12 (2002): 1238-48. Garnick, D. W., Horgan, C. M., Hodgkin, D., Merrick, E. L., Goldin, D., Ritter, G., Skwara, K. C.. "Risk transfer and accountability in managed care organizations' carve-out contracts." Psychiatr Serv 52. 11 (2001): 1502-9. Huskamp, H. A., Garnick, D. W., Hanson, K. W., Horgan, C.. "The impact of withdrawals by Medicaid managed care plans on behavioral health services." Psychiatr Serv 52. 5 (2001): 600-2. Merrick, E. L., Garnick, D. W., Horgan, C. M., Goldin, D., Hodgkin, D., Sciegaj, M.. "Benefits in behavioral health carve-out plans of Fortune 500 firms." Psychiatr Serv 52. 7 (2001): 943-8. Hodgkin, D., Horgan, C. M., Garnick, D. W., Merrick, E. L., Goldin, D.. "Why carve out? Determinants of behavioral health contracting choice among large U.S. employers." J Behav Health Serv Res 27. 2 (2000): 178-93. McCorry, F., Garnick, D. W., Bartlett, J., Cotter, F., Chalk, M.. "Developing performance measures for alcohol and other drug services in managed care plans. Washington Circle Group." Jt Comm J Qual Improv 26. 11 (2000): 633-43. Swartz, K., Garnick, D. W.. "Adverse selection and price sensitivity when low-income people have subsidies to purchase health insurance in the private market." Inquiry 37. 1 (2000): 45-60. Swartz, K., Garnick, D. W.. "Lessons from New Jersey." J Health Polit Policy Law 25. 1 (2000): 45-70. Garnick, D. W., Swartz, K.. "Meeting information needs: lessons learned from New Jersey's Individual Health Insurance Reform Program." Med Care Res Rev 56. 4 (1999): 456-70. Merrick, E. L., Garnick, D. W., Horgan, C. M., Goldin, D., Hodgkin, D., Sciegaj, M.. "Use of performance standards in behavioral health carve-out contracts among Fortune 500 firms." Am J Manag Care 5 Spec No. (1999): SP81-90. Swartz, K., Garnick, D. W.. "Can adverse selection be avoided in a market for individual health insurance?." Med Care Res Rev 56. 3 (1999): 373-88. Swartz, K., Garnick, D. W.. "Hidden assets: health insurance reform in New Jersey." Health Aff (Millwood) 18. 4 (1999): 180-7. Garnick, D. W., Swartz, K., Skwara, K. C.. "Insurance agents: ignored players in health insurance reform." Health Aff (Millwood) 17. 2 (1998): 137-43. Garnick, D. W., Hendricks, A. M., Comstock, C., Horgan, C.. "Do individuals with substance abuse diagnoses incur higher charges than individuals with other chronic conditions?." J Subst Abuse Treat 14. 5 (1997): 457-65. Hodgkin, D., Horgan, C. M., Garnick, D. W.. "Make or buy: HMOs' contracting arrangements for mental health care." Adm Policy Ment Health 24. 4 (1997): 359-76. Garnick, D. W., Hendricks, A. M., Drainoni, M., Horgan, C. M., Comstock, C.. "Private sector coverage of people with dual diagnoses." J Ment Health Adm 23. 3 (1996): 317-28. Garnick, D. W., Horgan, C. M., Hendricks, A. M., Comstock, C.. "Using health insurance claims data to analyze substance abuse charges and utilization." Med Care Res Rev 53. 3 (1996): 350-68. Parente, S. T., Weiner, J. P., Garnick, D. W., Fowles, J., Lawthers, A. G., Palmer, R. H.. "Profiling resource use by primary-care practices: managed Medicare implications." Health Care Financ Rev 17. 4 (1996): 23-42. Tompkins, C. P., Bhalotra, S., Garnick, D. W., Chilingerian, J. A.. "Physician profiling in group practices." J Ambul Care Manage 19. 4 (1996): 28-39. Fowles, J. B., Lawthers, A. G., Weiner, J. P., Garnick, D. W., Petrie, D. S., Palmer, R. H.. "Agreement between physicians' office records and Medicare Part B claims data." Health Care Financ Rev 16. 4 (1995): 189-99. Garnick, D. W., DeLong, E. R., Luft, H. S.. "Measuring hospital mortality rates: are 30-day data enough? Ischemic Heart Disease Patient Outcomes Research Team." Health Serv Res 29. 6 (1995): 679-95. Garnick, D. W., Hendricks, A. M., Rinaldo, S. G.. "Managed mental health--finding coverage that fits." Bus Health 13. 12 (1995): 29-33. Lawthers, A. G., Palmer, R. H., Banks, N., Garnick, D. W., Fowles, J., Weiner, J. P.. "Designing and using measures of quality based on physician office records." J Ambul Care Manage 18. 1 (1995): 56-72. Parente, S. T., Weiner, J. P., Garnick, D. W., Richards, T. M., Fowles, J., Lawthers, A. G., Chandler, P., Palmer, R. H.. "Developing a quality improvement database using health insurance data: a guided tour with application to Medicare's National Claims History file." Am J Med Qual 10. 4 (1995): 162-76. Weiner, J. P., Parente, S. T., Garnick, D. W., Fowles, J., Lawthers, A. G., Palmer, R. H.. "Variation in office-based quality. A claims-based profile of care provided to Medicare patients with diabetes." JAMA 273. 19 (1995): 1503-8. Garnick, D. W., Fowles, J., Lawthers, A. G., Weiner, J. P., Parente, S. T., Palmer, R. H.. "Focus on quality: profiling physicians' practice patterns." J Ambul Care Manage 17. 3 (1994): 44-75. Garnick, D. W., Hendricks, A. M., Comstock, C. B.. "Measuring quality of care: fundamental information from administrative datasets." Int J Qual Health Care 6. 2 (1994): 163-77. Garnick, D. W., Hendricks, A. M., Dulski, J. D., Thorpe, K. E., Horgan, C.. "Characteristics of private-sector managed care for mental health and substance abuse treatment." Hosp Community Psychiatry 45. 12 (1994): 1201-5. Garnick, D. W., Lawthers, A. G., Palmer, R. H., Moentmann, S. J., Fowles, J., Weiner, J. P.. "A computerized system for reviewing medical records from physicians' offices." Jt Comm J Qual Improv 20. 12 (1994): 679-94. Garnick, D. W., Hendricks, A. M., Thorpe, K. E., Newhouse, J. P., Donelan, K., Blendon, R. J.. "How well do Americans understand their health coverage?." Health Aff (Millwood) 12. 3 (1993): 204-12. Lawthers, A. G., Palmer, R. H., Edwards, J. E., Fowles, J., Garnick, D. W., Weiner, J. P.. "Developing and evaluating performance measures for ambulatory care quality: a preliminary report of the DEMPAQ project." Jt Comm J Qual Improv 19. 12 (1993): 552-65. Phibbs, C. S., Mark, D. H., Luft, H. S., Peltzman-Rennie, D. J., Garnick, D. W., Lichtenberg, E., McPhee, S. J.. "Choice of hospital for delivery: a comparison of high-risk and low-risk women." Health Serv Res 28. 2 (1993): 201-22. Thorpe, K. E., Hendricks, A., Garnick, D., Donelan, K., Newhouse, J. P.. "Reducing the number of uninsured by subsidizing employment-based health insurance. Results from a pilot study." JAMA 267. 7 (1992): 945-8. Garnick, D. W., Hendricks, A. M., Brennan, T. A.. "Can practice guidelines reduce the number and costs of malpractice claims?." JAMA 266. 20 (1991): 2856-60. Luft, H. S., Garnick, D. W., Phibbs, C. S., Peltzman, D. J., Lichtenberg, E., McPhee, S. J.. "Modeling the effect of hospital charges and quality on choice." J Health Care Mark 11. 3 (1991): 2-11. Garnick, D. W., Luft, H. S., Gardner, L. B., Morrison, E. M., Barrett, M., O'Neil, A., Harvey, B.. "Services and charges by PPO physicians for PPO and indemnity patients. An episode of care comparison." Med Care 28. 10 (1990): 894-906. Luft, H. S., Garnick, D. W., Mark, D. H., Peltzman, D. J., Phibbs, C. S., Lichtenberg, E., McPhee, S. J.. "Does quality influence choice of hospital?." JAMA 263. 21 (1990): 2899-906. Garnick, D. W., Lichtenberg, E., Phibbs, C. S., Luft, H. S., Peltzman, D. J., McPhee, S. J.. "The sensitivity of conditional choice models for hospital care to estimation technique." J Health Econ 8. 4 (1989): 377-97. Garnick, D. W., Luft, H. S., McPhee, S. J., Mark, D. H.. "Surgeon volume vs hospital volume: which matters more?." JAMA 262. 4 (1989): 547-8. Hughes, R. G., Garnick, D. W., Luft, H. S., McPhee, S. J., Hunt, S. S.. "Hospital volume and patient outcomes. The case of hip fracture patients." Med Care 26. 11 (1988): 1057-67. Luft, H. S., Garnick, D. W., Hughes, R. G., Hunt, S. S., McPhee, S. J., Robinson, J. C.. "Hospital competition, cost, and medical practice." J Med Pract Manage 4. 1 (1988): 10-5. Garnick, D. W., Luft, H. S., Robinson, J. C., Tetreault, J.. "Appropriate measures of hospital market areas." Health Serv Res 22. 1 (1987): 69-89. Robinson, J. C., Garnick, D. W., McPhee, S. J.. "Market and regulatory influences on the availability of coronary angioplasty and bypass surgery in U.S. hospitals." N Engl J Med 317. 2 (1987): 85-90. Rosenfeld, K., Luft, H. S., Garnick, D. W., McPhee, S. J.. "Changes in patient characteristics and surgical outcomes for coronary artery bypass surgery 1972-82." Am J Public Health 77. 4 (1987): 498-500. Showstack, J. A., Garnick, D. W., Rosenfeld, K. E., Luft, H. S., Schaffarzick, R. W., Tunis, S., Fowles, J.. "Episode-of-care physician payment: a study of coronary artery bypass graft surgery." Inquiry 24. 4 (1987): 376-83. Showstack, J. A., Rosenfeld, K. E., Garnick, D. W., Luft, H. S., Schaffarzick, R. W., Fowles, J.. "Association of volume with outcome of coronary artery bypass graft surgery. Scheduled vs nonscheduled operations." JAMA 257. 6 (1987): 785-9. Garnick, D. W., Luft, H. S., Hunt, S. S.. "Office visit patterns in physician group practices." GHAA J 7. 2 (1986): 13-21. Luft, H. S., Robinson, J. C., Garnick, D. W., Hughes, R. G., McPhee, S. J., Hunt, S. S., Showstack, J.. "Hospital behavior in a local market context." Med Care Rev 43. 2 (1986): 217-51. Luft, H. S., Robinson, J. C., Garnick, D. W., Maerki, S. C., McPhee, S. J.. "The role of specialized clinical services in competition among hospitals." Inquiry 23. 1 (1986): 83-94. McPhee, S. J., Garnick, D. W.. "Imaging the heart: cardiac scintigraphy and echocardiography in U.S. hospitals (1983)." J Nucl Med 27. 10 (1986): 1635-41. Garnick, D. W., Maerki, S. C.. "Activities of physicians in urban hospitals." Urban Health 13. 7 (1984): 36-7, 50.